The likelihood of a U.S. Federal Reserve interest rate hike in June is mostly off the table in the wake of Friday's jobs report. On Friday, June 3, the U.S. Labor Department reported employers added only 38,000 jobs in May – the weakest performance since September 2010. Payroll figures for April and March were revised downward by a combined 59,000 fewer jobs than previously reported. The May jobs report and revisions for April and March reduced the average monthly job growth in the past three months to 116,000. That marks a steep slowdown from the average growth of 219,000 over the last 12 months. While the unemployment rate fell from 5% in April to 4.7% last month, it was only because 664,000 people (more than Vermont's total population) dropped out of the workforce. While this shifts the likelihood for an interest rate hike next week, it does open up the investment opportunity we're going to show you today. The odds of a rate hike fell from 22% on Thursday to a slim 4% the next day. Odds of a July rate hike declined from 42% to 36%. For September, chances of the Fed increasing rates are 51%. A number of analysts, including BNP Paribas, have longer positions on the Fed's dovishness. In fact, BNP doesn't see the U.S. central bank raising rates until 2018. According to Barron's, this is already the longest stretch in 40 years between a first rate hike and a second. The Fed last raised rates in December 2015, which was the first rate hike since 2006. You have to go back nearly 20 years to find a "one and done" interest rate move from the Fed. After raising rates in March 1997, policymakers reversed their move by trimming rates in 1998, after the bond-focused hedge fund Long-Term Capital Management collapsed. The firm's dissolution was caused by the Asian and Russian financial crises of 1997 and 1998, respectively. 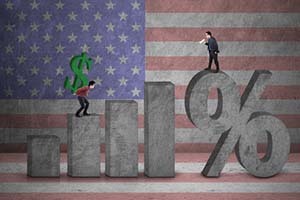 With a June rate hike clearly out of the question, Krauth says there's one exchange-traded fund (ETF) that offers a great way to profit from the Fed's inaction. His pick has gained nearly 14% so far this year, handily outperforming the three major benchmarks. In comparison, the Dow and S&P 500 are up 2.7% and 2.2%, respectively, while the Nasdaq is down 0.9%. In this low interest rate climate, Krauth recommends investments that deal with tangible assets. These include commodities like copper, gold, and oil, which offer a way to preserve your purchasing power. 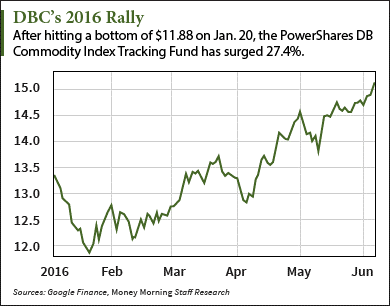 Investors can gain profitable exposure to these commodities and others with the PowerShares DB Commodity Index Tracking Fund (NYSE Arca: DBC). This ETF has a $2.43 billion market cap – higher than most commodity index-tracking funds – and provides an easy way to invest in these commodities' futures contracts. That means DBC lets investors own these commodities without having to physically own them. The fund follows the futures contracts of 14 commodities. These include aluminum, Brent crude oil, silver, gold, heating oil, zinc, and eight others. But the best commodity held by the fund right now is oil, which has gained 31.3% so far this year and is poised to go even higher. Following the latest OPEC meeting on June 2, Saudi Arabia's new energy minister told CNN Money he expects crude oil prices to reach $60 a barrel by the end of 2016. DBC is also heavily weighted in silver, which is up more than 16% this year. With a 13.4% year-to-date advance, Krauth sees more upside for DBC. As investors grow anxious about a global economic slowdown and look for returns in a world where more than $10 trillion of fixed-income investments have negative yields, they will increasingly pile into futures-invested funds like DBC.